Dr Oen was made Senior Consultant Ophthalmologist in 2003 and took over as Head, Glaucoma Service, Singapore National Eye Centre in April 2005, a position which he held till April 2008. Presently, Dr Oen also returns to Singapore National Eye Centre on a part-time basis to teach and mentor Ophthalmology Residents and Fellows in their training programmes. 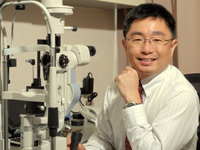 He is also the current Vice-President of Glaucoma Surgeons Singapore.